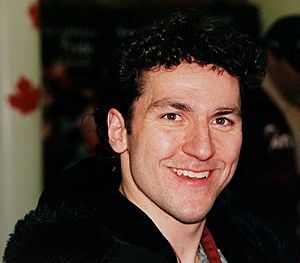 Elvis Stojko (born March 22, 1972 in Newmarket, Ontario ) is a Canadian figure skater. He was world champion three times, and Canadian champion seven times. Stojko was named after Elvis Presley, and sometimes skates to Presley's music. He grew up in Richmond Hill, Ontario. He started skating when he was four years old. He also became a black belt in karate (which has influenced some of his skating). Stojko was the first person to do a quadruple-triple jump combination. He became known for his athletic ability. Today he is a professional skater, and also competes in karate. World Championships: first place in 1994, 1995, and 1997. Olympics: silver in both 1994 and 1998. Canadian Championships: first place in 1994, 1996, 1997, 1998, 1999, 2000, and 2002. Elvis Stojko Facts for Kids. Kiddle Encyclopedia.